Join me this October for Match Play, a poncho featuring high-impact textured stitches and great techniques. Match Play has a bit of structure as I nudge you toward full sweater knitting. The best aspect of this poncho is that it has an easygoing fit to be figure-flattering on everyone. Match Play’s design features a vertical central motif to elongate every silhouette and who doesn’t like that? I discovered a new way to execute a favorite stitch that will forever change this technique for you. Perhaps life changing is a bit strong of a term, but it certainly rocked my world! I am excited to share the updated stitch and its accompanying video with you. The true luxury of Match Play is due to the glorious Sueno yarn. This merino/bamboo blend gives the fabric drape, fluidity and sheen along with excellent stitch definition. The photo above shows my initial design sketch. No need for registration and the pattern is FREE. Simply go to my website any time after 9am Eastern time on October 4th to view the first part of the pattern. Part One will include lots of tips, photos and video lessons to help you along the way. You will also be able to download a printable copy for knitting on the go. I monitor questions daily both on my website and in my Ravelry group so it is like having your own private knitting tutor. Be sure to subscribe to my newsletter to receive an email reminder prior to the start of the KAL. I will be releasing tempting, mini clues up until the KAL debut on October 4th so stay tuned. Welcome to the Progressive Needles Knit Along sponsored by Skacel Collection! As always, the KAL brings a new pattern solely focused on increasing your knitting skills. Behind The Scenes is a cabled scarf which is buttoned up to be worn as a cowl. 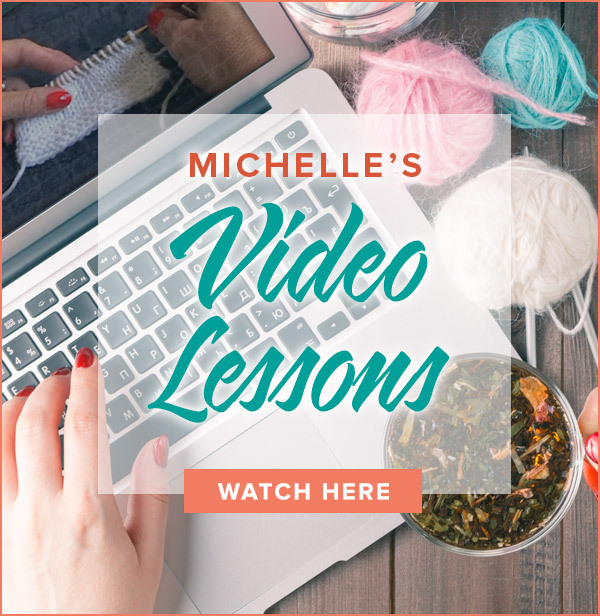 Whether you are a novice or experienced cable knitter, this design provides plenty of learning opportunities. Projects completed by November 15 are eligible for the monthly prize drawing – first prize is a set of addi Clicks! See skacelknitting.com for all the info. VERY IMPORTANT: Behind The Scenes is a FREE pattern through November 30. After this date, it will only be available for purchase on Ravelry. Be sure to download each portion of the pattern prior to this date. The helpful tips and videos for each section will remain on my website indefinitely. The reason for naming this pattern Behind The Scenes is two-fold. First, I will be giving you a glimpse into the design process and the decisions driving the stitch and technique choices. 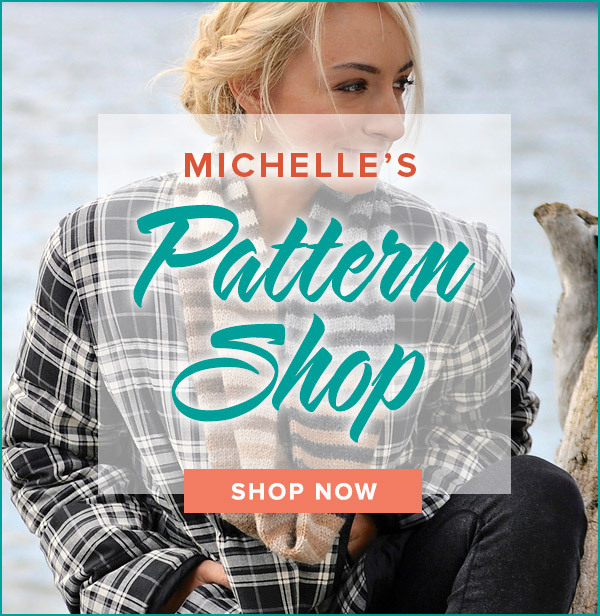 This backstage look will not only help you knit this pattern successfully, it will give you the confidence to try your own hand at designing and modifying patterns. Secondly, all cables are formed when a group of stitches are “behind” another group of stitches. Our pattern will contain explanations to help you understand the role of these background stitches. 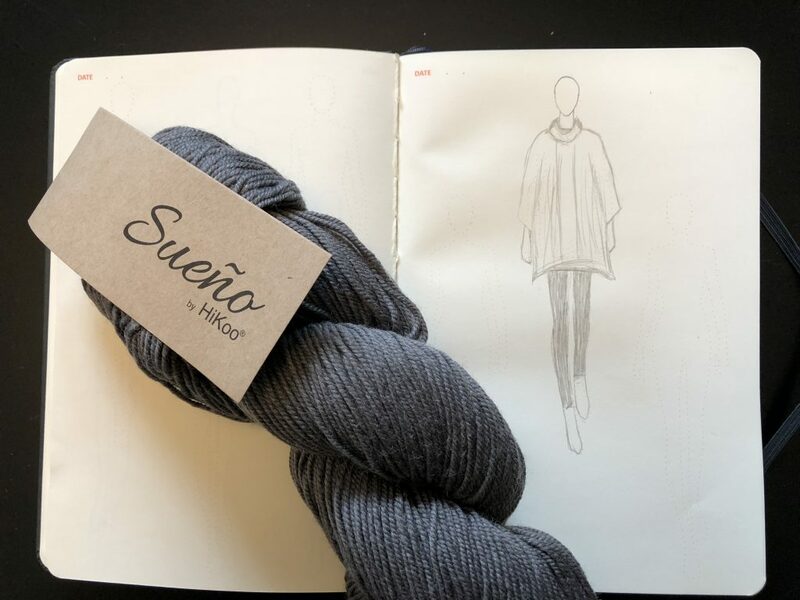 The pattern has the added bonus of being knit with the delightful softness of HiKoo Oh! yarn. When the yarn was in its development, all who touched it exclaimed “Oh!” and its name was born. One touch and you will agree with the choice! This yarn is manufactured on one of the very few machines worldwide that can create a chainette construction directly from roving. Since the yarn is never spun, it allows for the fiber to be as soft as possible, while maintaining durability and strength. You’ll love wearing it around your neck! One of the biggest challenges for a designer is determining how much yarn to recommend for the pattern. If the design uses too much yarn, then there is a risk of knitters running short of yarn and that is a HUGE problem. On the flip side, having too much yarn left over leaves many knitters unhappy about purchasing the last skein. All of us would love to knit up every inch of yarn in the project, but it is nearly impossible to design a pattern for that. In Behind The Scenes, the pattern leaves 18 g/34 yards leftover when knit to gauge. Even the most careful swatching can result in a variation of yarn usage. For this reason, I include the yarn weight at the conclusion of each section. Weigh your skein throughout the pattern to evaluate your usage compared to mine. Should your yardage differ, there will an opportunity to adjust the length of the piece in Part 3 of the KAL. Part One begins with a flat lying edge leading into horseshoe shaped cables that will house each button. Garter stitch is perfect for this edge to prevent curling with just a minimum of rows. Cast on for this edge using the Long Tail Cast On. This cast on places knit stitches on the needle. At the completion of the cast on in flat knitting, the work is turned leaving purl stitches facing front. The purl stitches blend nicely into the garter edge and helps promote stability. Cables are made by slipping a number of stitches from the left needle to a cable needle. The cable needle stitches are then held to either the front or the back of the work while working a number of stitches off of the left hand needle. Lastly, the stitches held on the cable needle are worked to complete the cable. Stitches held to the back of the work will create a cable that leans (crosses) to the right. Stitches held to the front of the work will result in a cable that leans (crosses) to the left. The photo above shows a square from my Building Blocks book that illustrates simple cables. The cables on the right hand side of the block lean right and the cable on the left hand side lean to the left. The center cable is known as a Staghorn Cable which is formed when a left and right leaning meet. In this example, the cables are formed from a column of stitches that are worked in all knit on the right side and all purl on the wrong side. My Cables video demonstrates how to execute a left and right leaning cable. In Behind The Scenes, the design features cables that travel across the fabric. To achieve this bit of knitting magic, the cables are worked in both knit and purl on the right and wrong sides. The stitches in the front of the cable will remain in knit and the stitches behind them will be worked in purl. In Part One, the traveling left leaning cable is worked by slipping two stitches to a cable needle and holding them in front. Next, purl two stitches from the left needle. Lastly, knit the two held stitches from the cable needle. I abbreviate this cable as FPK. This is my shorthand for hold stitches to the Front, Purl the next two stitches, Knit stitches off cable needle. The traveling right leaning cable is worked by slipping two stitches to a cable needle and holding them in back. Next, knit two stitches from the left needle. Lastly, purl the two held stitches from the cable needle. I abbreviate this cable as BKP. This is my shorthand for hold stitches to the Back, Knit the next two stitches, Purl stitches off cable needle. Both of the above cables are executed like a standard cable stitch except that one group of the stitches is worked in purl on the right side. This deviation will surely keep you on your toes! I have provided both charted and written instructions for this pattern. The cables are color coded in the chart for easy reading. Even if you do not work from the chart, I encourage you to use it to compare the design with the stitches on your needle. When working from the written instructions, consider color coding the cable abbreviations within the pertinent rows to match the charted instructions. (Highlighters work perfectly!) This makes it easier on the eyes and avoids executing the incorrect cable. If you find a mis-crossed cable several rows back, watch my Fixing a Mis-Crossed Cable video for a repair tutorial. If you are an experienced cable knitter and are looking for a challenge. Try executing these cables without a cable needle. Since the needles and yarn are larger, it is a good project to give this technique a try. See Cables Without A Cable Needle video. The photo below shows Part One completed. The piece has not been blocked so the button areas inside the four “horseshoes” are slightly small for my larger 1″ buttons. Blocking will widen this area and it will also correct the edges from drawing in. Next week brings us more new cables to add to the mix! Prior to blocking – 45”long, 7” wide. After blocking – 47”long, 8 ½” wide. BKP (Back, Knit, Purl) – slip 2 stitches to cable needle and hold in back, knit 2 from left needle, purl 2 from cable needle. FPK (Front, Purl, Knit) – slip 2 stitches to cable needle and hold in front, purl 2 from left needle, knit 2 from cable needle. wyif – with yarn in front. My next knit along, Behind The Scenes, begins October 5th with a new yarn and more new skills. 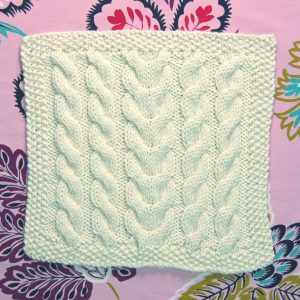 This unique mystery pattern is a gorgeous cabled design sure to increase your cable skills and knowledge. Behind The Scenes is knit as a long rectangle that may be worn as a scarf or stylishly buttoned into a cozy cowl. The cowl is knit in HiKoo’s brand new yarn Oh! 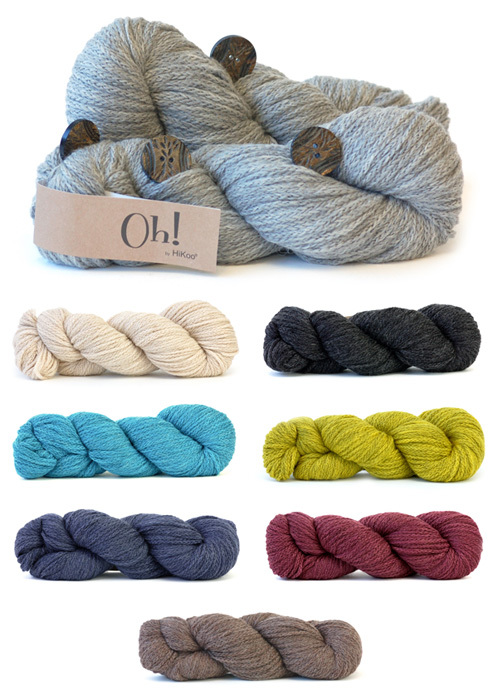 Available in eight colors, this chunky yarn is made of 100% Super Baby Alpaca for unprecedented softness. One touch and you will know exactly how the yarn got its name because everyone who holds this amazing yarn immediately sighs, “Oh!”. Once again, button selection was tons of fun for me. Since they are a prominent feature in the pattern, I wanted a button that was a complement to the bold cable work. I chose the 1″ horn buttons seen nestled in the yarn above. For those interested, the buttons are by Skacel buttons #BM0718H30. All of my KALs are a 4-part mystery pattern with one section revealed each week on my website. The knit along is FREE with no registration required. Simply go to my website on October 5th after 9am Eastern time to view the first clue. What’s not a mystery, is that all of the skills are supported with my online video instruction. I answer questions daily on my website and Ravelry to guarantee success. I had the great joy of knitting Behind The Scenes with my first pair of olive wood needles. The richly smooth wood made a gentle sound with a restful feel in my hands. 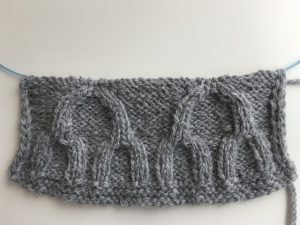 Please join me as we knit a baby sweater in my next Knit Along, Adorable Ewe. Knit in the soft and washable Simpliworsted, this project is brimming with essential sweater knitting skills. My KALs are always a mystery, but I will let you know that this sheep-themed sweater is too cute to miss! Every knitter should have a baby sweater on hand for gift giving. They are also great way to gain sweater experience. Whether you are a novice or a seasoned sweater knitter, this project has something for you. The sweater is sized to fit a six month old baby and is appropriate for a boy, girl or waiting for the gender reveal. Two skeins of any main color are needed. Additionally, white or natural is a must for the sheep with black for the accents. Perhaps the most fun is selecting four buttons for the sweater. 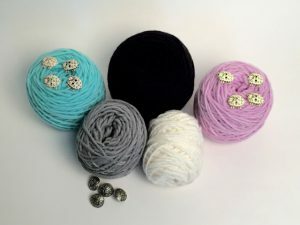 I adore Skacel’s new sheep buttons available in white (above on blue yarn) and natural (above on pink yarn). The metal circle buttons worked well with the gender neutral gray. The KAL begins April 6th with a portion of the pattern revealed here each Thursday in April. Knitters who finish the sweater by May 15th are eligible for the prize drawing sponsored by Skacel. The KAL is FREE and no registration is required. Simply go toknitpurlhunter.com on April 6th to download your copy of the pattern. All of the techniques are supported with my video tutorials. I answer questions daily online at my website and in my Ravelry group. I highly recommend joining my Ravelry group for up to the minute KAL conversations. Simpliworsted by HiKoo, 55% merino superwash, 28% acrylic, 17% nylon, 100g/140 yards. 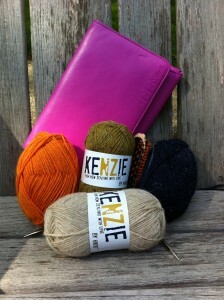 Join me October 3rd for a mystery KAL to create a fabulous cowl featuring four colors of gorgeous Kenzie yarn. I am recently obsessed with color knitting (subject of my next book) and am very excited to bring you this new pattern! Colormatic magically combines colors and stitch patterns for high impact. Four skeins (one of each color) will yield a cowl up to 32″. Eight skeins (two of each color) will yield an infinity cowl up to 68″ to wear fashionably doubled. The toughest part of the pattern is color selection – they are all beautiful! Look here for a complete listing of colors. The featured sample was knit with #1000 Pavlova (natural), #1006 Kumara (orange), #1007 Kiwi (bright green) and #1009 Oceania (navy). I can’t wait to see what colors you choose. The design is lots of fun for both novice and veteran color knitters. I will have new videos, of course, to help you along the way and questions are monitored daily. Beware, EVERYONE will want you to knit one for them – it makes a great Holiday gift. Need more incentive? Completed cowls may be entered in the prize drawing to win a set of addi Clicks generously supplied by our sponsor, Skacel Collection. A portion of the four-part mystery pattern is revealed each Thursday at 9am EDT beginning October 3rd at knitpurlhunter.com Questions are answered daily both on the website and in the Knit Purl Hunter group on Ravelry. There is no registration and it’s FREE! 4 (8) skeins Kenzie by HiKoo, 50% New Zealand merino, 25% nylon, 10% angora, 10% alpaca, 5% silk noils 1(2) each in four different colors. Gauge – Approximately 20 stitches = 4 inches with smaller needle.